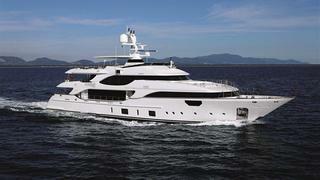 SOY AMOR is a Loading... luxury yacht, built by Benetti and delivered in 2014. Her top speed is 15.0kn and she boasts a maximum cruising range of 4000.0nm at 10.0kn with power coming from two 1450.0hp Caterpillar C-32 diesel engines. She can accommodate up to 10 people with 7 crew members waiting on their every need. She was designed by Stefano Righini, and the interior design was created by Francois Zuretti. Subscribe to BOAT Pro to access brokerage sales data and unlimited specs for 11,671 yachts in our Superyacht Directory – the world’s most comprehensive superyacht data.